Must freedom be sacrificed to achieve ecological sustainability - or vice versa? Can we be genuinely free and live in sustainable societies? This book argues that we can, if we recognise and celebrate our ecological embeddedness, rather than seeking to transcend it. But this does not mean freedom can simply be redefined to fit within ecological limits. Addressing current unsustainability will involve significant restrictions, and hence will require political justification, not just scientific evidence. 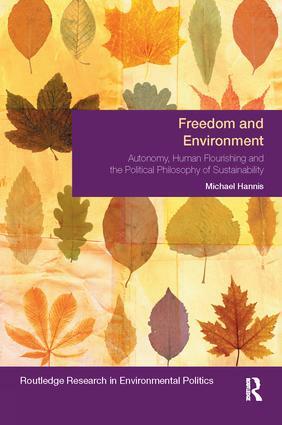 Drawing on material from perfectionist liberalism, capabilities approaches, human rights, relational ethics and virtue theory, Michael Hannis explores the relationship between freedom and sustainability, considering how each contributes to human flourishing. He argues that a substantive and ecologically literate conception of human flourishing can underpin both capability-based environmental rights and a eudaimonist ecological virtue ethics. With such a foundation in place, public authorities can act both to facilitate ecological virtue, and to remove structural incentives to ecological vice. Freedom and Environment is a lucid addition to existing literature in environmental politics and virtue ethics, and will be an excellent resource to those studying debates about freedom with debates about ecological sustainability.